We Koreans love ramen as much as Japanese. One chopstick of noodle followed by the sip of broth makes us ‘ah~’ and we cannot deny this. Back in the days, ramen was the one that filled up our hunger struck stomach without an arm and a leg and was the playful snack we often crushed to eat during the class at school. Lee Min-gyu, CEO of MANYAMATSURI, went to Japan to know better of authentic Japanese ramen and worked hard. He then mastered Hakata ramen which is often credited as a national dish of Japan. Back in Korea, he now is a few of those who can make its own noodle (straight noodle in Lee’s case) as well as broth by hands in Korea. Hakata ramen noodle is thin and straight and prepared fast. For this reason, it is widely enjoyed by market merchants. The word ‘Manyamatsuri’ means ‘festival of noodle’ in Japanese and Lee intends to invite all of those who love noodle to the festival. Lee launched the first MANYAMATSURI in Ssangyong-dong, Cheonan, in November 2012. In March 2015, he opened the second restaurant in Asan Mediterranean town and in April 2017, the third one in Sinbu-dong, Cheonan. The word spread from mouth to mouth among the residents at first. Then the name started to appear to well-known TV shows of SBS, TBJ and KBS2. In 2016, MANYAMATSURI was invited to the Korea International Ramen Fair and in 2017 Lee received the best restaurant plaque from Cheonan City two years in a row. In 2018, he earned a citation from the National Assembly. “MANYAMATSURI is not the first ramen restaurant but I will grow the brand as the last ramen maker on earth” says Lee. As part of this effort, Lee has built his own management and franchise system by gathering his knowhow and knowledge of the last 10 years. 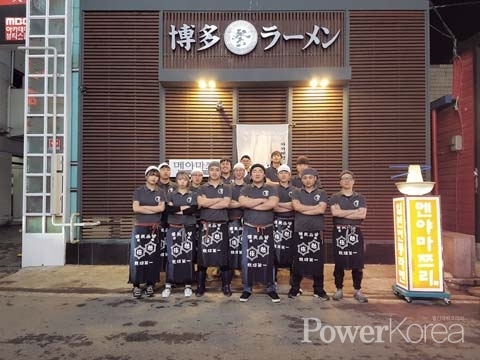 Quite recently, MANYAMATSURI won the 2019 Brilliant People & Brand Awards in the premium ramen franchise category. On 21 March, Lee is participating in the 51th Korea Franchise Business Expo held at SETEC to introduce excellence of MANYAMATSURI alongside ramen making event.